Beloved by Uzbeks, Tajiks, Kyrgz, Kazakhs, Pashtuns and Turkmens as well as Afghans, the equestrian sport known as Kokpar or Buzkashi is a rugged, and traditionally extremely violent, game similar to polo with one surprising twist; rather than hitting a ball with mallets toward a goal, players vie for control of a headless animal carcass. While at first glance this may seem a tad barbaric, it’s really not all that strange when you consider footballs used to be made with pig bladders and baseballs are covered in cowhide. It is widely believed the game was first played in the Oxus basin, now known as the Amu Darya, along a border of Afghanistan. Although its beginnings are lost in time, many claim that the sport began when Genghis Khan’s Mongols, who brutally invaded the area, pillaged goats and sheep while riding at full speed on horseback. To retrieve their property, the story goes, brave Afghan villagers would likewise gallop into Mongol camps to take back their stolen livestock. As the sting of invasion and thievery wore off over time, apparently the men grew to enjoy the chase, and a new sport was born. Up until quite recently, there were only two rules: You do not talk about Buzkashi, and . . . kidding. The two rules are that no rider may intentionally strike another with his whip or knock an opponent off his horse. Other than that, anything goes! Armed with whips (ostensibly for use only on the horses) and equipped with special boots that hook tightly into their saddles, players fight each other fiercely for control of the prize – a carcass. Traditionally a goat that is disemboweled, decapitated and had its limbs removed below the knee joint, the carcass would be soaked in water for at least a day to toughen the skin. In modern practice, a calf is frequently used since its hide is considered to be much more resilient. Today, there are three variants of the game: tudabarai, qarajai and a version only played in Kabul. Eventually, one rider, known as a Chapandaz, will have “dipped to the ground and grabbed with one hand the goat carcass…” riding away from the initial circle in any direction getting clear. The winning rider will remain free of the others until the game is called. In this version, play begins in a circle, but the successful rider must not only control the carcass, but also carry it around a flagpole and then drop it in a designated place, known as the “Circle of Justice.” Points are awarded, and presumably play continues until one team is deemed the winner. Very recently, as part of an effort to have Buzkashi made an Olympic sport, the Afghan Olympic Federation created official rules for a much milder version of the sport. Observed only in Kabul, this official version limits the field of play to a square with sides of 400 meters. The number of riders is also limited – to official rosters of no more than 10 players, with each team having only five on the field at a time. 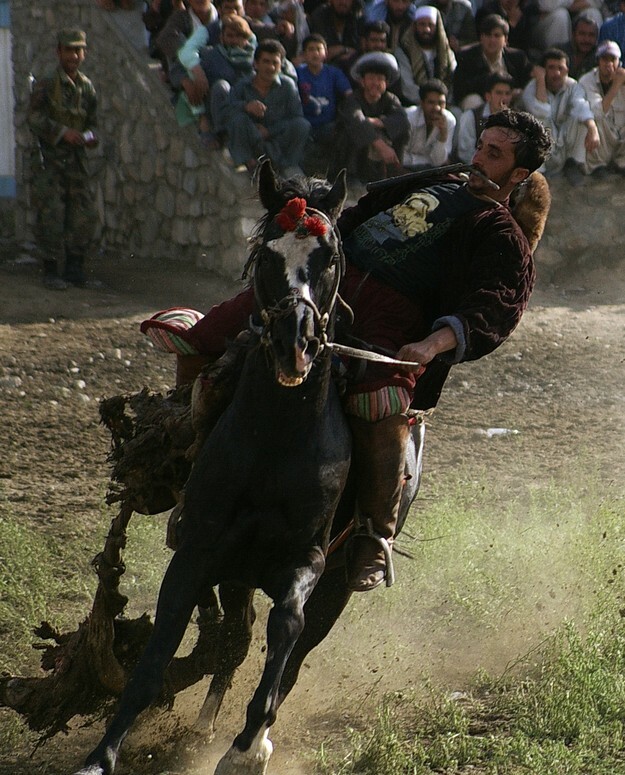 In addition, as opposed to the open-ended play of the more traditional versions of Buzkashi, the official rules limit Kabul Buzkashi to two 45-minute halves. Even more distressing to the traditionalist, the official version has a referee on the field! Proud of their ancient breeds, Afghans primarily use two types of horses in Buzkashi: the small, swift and sturdy Tartar, and the large breed that came from the plains of Turkestan, Habash. Other horses used in the sport include the Arabi, Tazi, Borta and Waziri. Regardless of breed, only un-castrated male horses, presumed to be stronger, are ridden. Special trainers, known as Sayez, spend years working with their stallions. Avoiding collisions and learning to never trample a fallen rider are two of a great Buzkashi horse’s main skills. The best are also able to push and even ram their way into the middle of the scrum, and then remain absolutely still despite the chaos going on around, while the rider reaches down to grab the goat or calf. Since raising a horse and finding the time away from work to train can be expensive, much of Buzkashi is financed by the wealthy. Common benefactors include warlords, entrepreneurs, merchants and generals. An industry all to itself, “children with handfuls of fifty- and hundred-dollar bills from wealthy spectators crisscross the bleachers to place bets with a bookie” during play, and this exchange leads to nice salaries for the Chapandazan. According to reports, successful players are well paid, receiving thousands of dollars in tips and driving luxury automobiles in a country where the average daily wage is under $2. Is Buzkashi Too Brutal for the 21st Century? When the Taliban ruled Afghanistan, they outlawed Buzkashi deeming it immoral, but since they’ve been ousted, Buzkashi’s popularity has once again surged within the nation, with some matches drawing several thousand people. Rather than names like Secretariat, Barbaro or Trigger, Buzkashi horses are named for their color, which include Kabood (grey), Gul Badam (dotted), Mushki (black), Ablaq (mixed), Kahar (yellow), Toroq (dark red) and Jerand (red). Spoiled in the offseason (Buzkashi is played on Fridays during the winter through early spring), the horses are fattened up on barley (sometimes enriched with butter and eggs) and melons.